Skeletal muscles come in different shapes and sizes but the main structure of a skeletal muscle cell is basically the same. If a cross-section is done of a single muscle, it can be seen that it is covered in a protective sheath or layer called the epimysium. The epimysium protects the muscle from friction against other muscles and bones, it also continues at the end of the muscle to form along with other connective tissues. The tendon which attaches the muscle to the bone each muscle is made up of a number of bundles of muscle fibers called fascicular. The fascicular are contained within another connective tissue called the Paramecium. Each bundle of muscle fibers contains anywhere from ten and a hundred individual fibers. A large strong muscle such as those in the quadriceps group would have a large number of fibers within each bundle. A smaller muscle used for precision movement such as those in the hand would contain far fewer muscle fibers in each bundle. 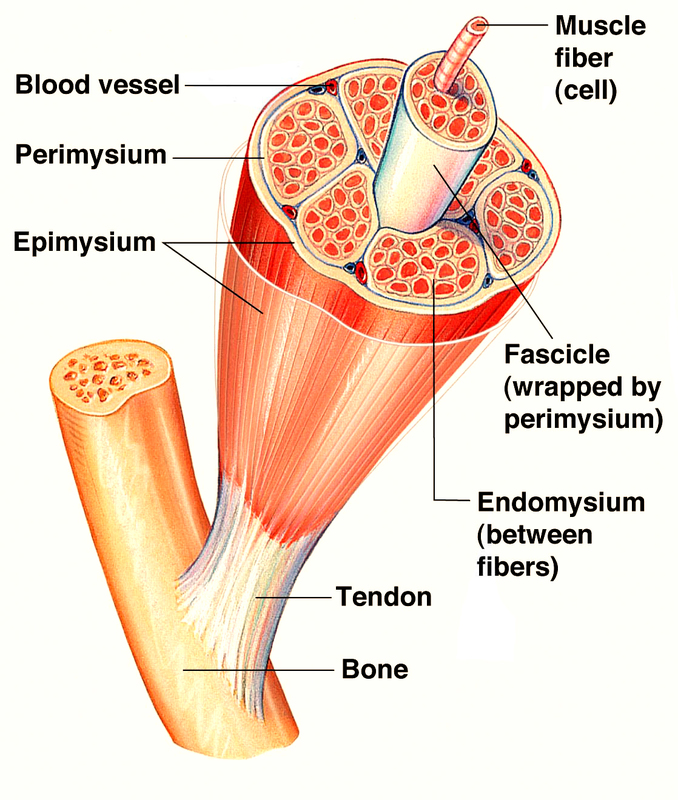 Each muscle fiber is also covered in a fibrous connective layer of tissues called the endomysium which insulates each fiber beneath the endomysium is the sarcolemma which is the muscle fibers cell membrane and beneath this is the sarcoplasm. This is a gelatinous fluid which contains glycogen and fats for energy as well as mitochondria inside which the cell’s energy is produced. Each muscle fiber itself contains cylindrical organelles known as myofibrils. Each muscle fiber contains hundreds or thousands of myofibrils which themselves are bundles of proteins called actin and myosin. These run the length of the muscle fiber and are important in muscle contraction. Surrounding the myofibril there is a network of tubules and channels called the sarcoplasmic reticulum where calcium is stored which is also important for muscle contraction. Each myofibril can be broken down into functional repeating segments called sarcomeres which are the basis for muscle contraction theory known as sliding filament theory. The arrangement of the Skeletal muscles is such that the muscle ends are attached to bones on each side of a joint causing the muscles to cover the joints. The muscle movement rely on the place of the muscle attachments and the type of the joint it is attached to. During contraction, a bone to which one end of the muscle is attached moves, but the bone to which the other end is attached does not. 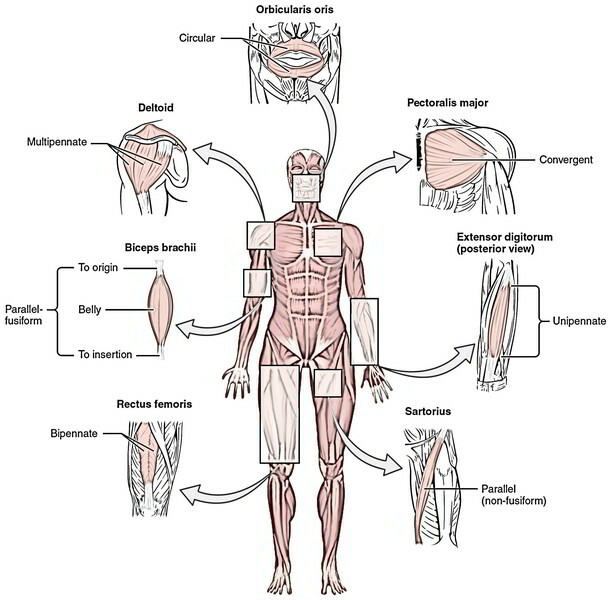 The movable attachment of a muscle is called the insertion, and the immovable attachment is called the origin. When a muscle contracts, the insertion is pulled toward the origin. Consider the biceps brachii in figure above. It has two origins, and both are attached to the scapula. The insertion is on the radius, and the muscle lies along the anterior surface of the humerus. When the biceps brachii contracts, the insertion is pulled toward the origin, which results in the flexion of the forearm at the elbow. Most muscle contractions are isotonic contractions, which cause movement at a joint. Walking and breathing are examples. However, some contractions may not produce movement but only increase tension within a muscle. Contractions that maintain body posture are good examples. Such contractions are isometric contractions. Muscles function in groups rather than singly, and the groups are arranged to provide opposing movements. For example, if one group of muscles produces flexion, the opposing group produces extension. A group of muscles producing an action are called agonists, and the opposing group of muscles are called antagonists. When agonists contract, antagonists must relax, and vice versa, for movement to occur. If both groups contract simultaneously, the movable body part remains rigid. Figure above illustrates how the biceps brachii is the agonist of forearm flexion, while the triceps brachii is the antagonist.